In modern physics light is assigned two qualities: A wave quality and a particle quality. The particle quality means that light consists of certain energy packages, so-called light quanta or photons. The energy that is contained in these photons is reflected in their wavelength – the physical distance between wave trough and wave crest. A short wavelength means a high energy content, a large wavelength means a low energy content. The photon is swallowed by the matter. The energy of the photon in this case is transferred to the matter and leads to an increase of the matter's energy content, either in the form of heating and/or electric excitation of the matter. Luminescence is the emission of photons (light) that are generated when electrons return from an excited state to a lower-energy state. In this case a distinction is made between fluorescence and phosphorescence. Fluorescence means that the emission of photons by the excited material stops immediately or within a few nanoseconds after excitation ends. Phosphorescence means that the emission of light continues beyond the nanosecond range and extends into the millisecond or even the second range. What is a "Stokes effect"? When electromagnetic radiation (light from ultraviolet to infrared) impinges on an object, part of the light is absorbed. The major part of the absorbed light is converted into heat (a black surface absorbs more light than for example a white surface and thus becomes correspondingly warmer when it is irradiated with light). The light essentially is absorbed by molecules. This additional energy excites the molecules to move faster, i.e. they oscillate at a higher rate, which involves an increase of temperature. In some materials (e.g. in so-called "rare earths") the energy of light (of photons) can be used to move electrons that rotate around the nucleus on a lower-energy but highly stable radius (inner electron radius) up to a higher-energy but more unstable radius (outer electron radius). The electrons only stay on this outer radius for a short time before they pass through the inter-mediate radiuses and return to their stable initial state again. The energy that is set free in this process is emitted as electromagnetic radiation (photons = light), or in a crystal (as is the case in rare earths) is transferred to the crystal in the form of so-called phonons (lattice oscillations) that excite the crystal to oscillate more intensively. The photons that are generated in this process (secondary photons) have a lower energy than the photons used for excitation (primary photons). Photons (priansmary photons) with a higher energy (i.e. light with a shorter wavelength) thus are used to cause an object to "shine". 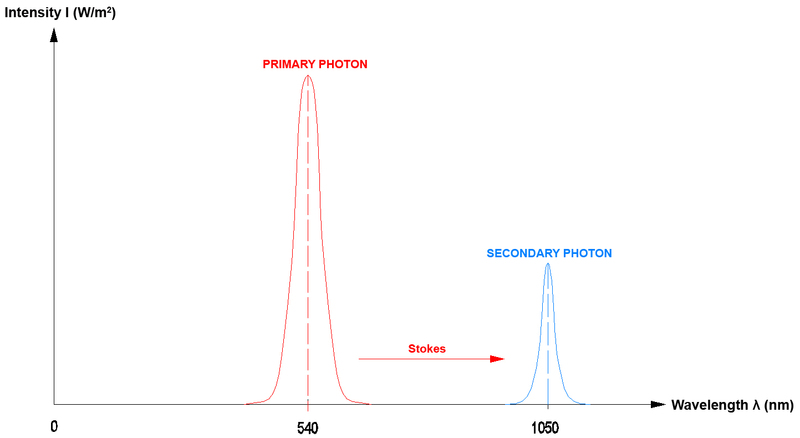 The photons that are emitted by the object (secondary photons) have a lower energy than the primary photons, which means that the emitted light has a longer wavelength. 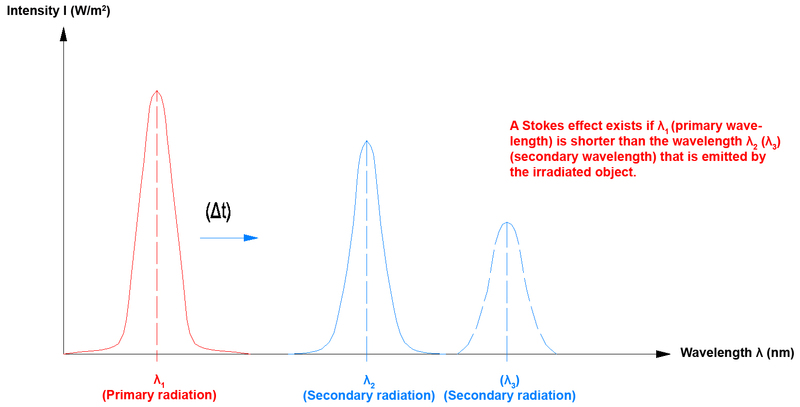 If the wavelength that is emitted by an irradiated object is longer than the wavelength that is used for irradiation, this is referred to as a so-called "Stokes effect". 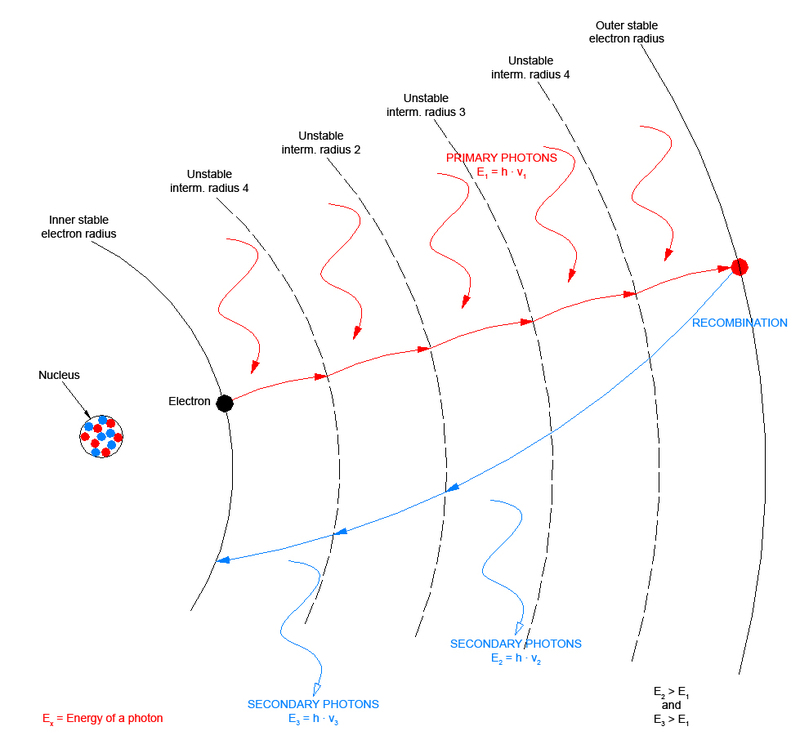 Secondary radiation is emitted with a time delay, the length of which depends on how long the electrons stay in the unstable electron radiuses. What is an "Anti-Stokes effect"? If electromagnetic radiation that impinges on an object and is absorbed by this object has a longer wavelength than the electromagnetic radiation that is emitted by the object, this is referred to as an "Anti-Stokes effect". l = Wavelength of an electromagnetic radiation (e.g. of light). The wavelength represents a wave train, i.e. the physical distance between two adjacent maximum or minimum values. The wavelength of electromagnetic radiation in the visible range approximately lies between 400 nm and 700 nm. 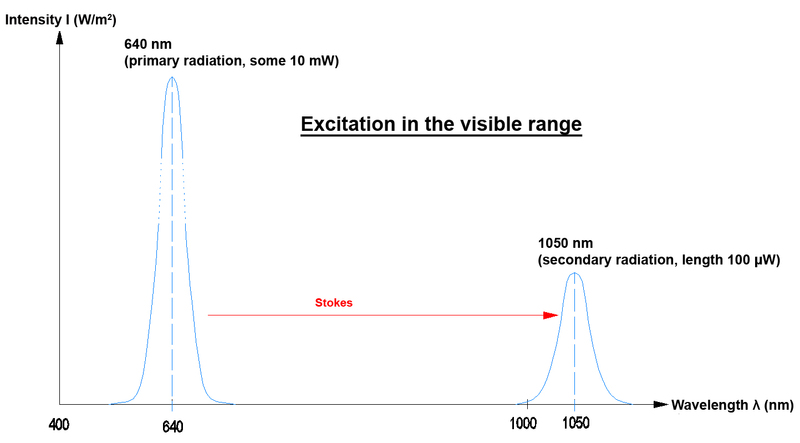 As opposed to the Stokes effect, several photons of the primary radiation are required here to excite the electrons. 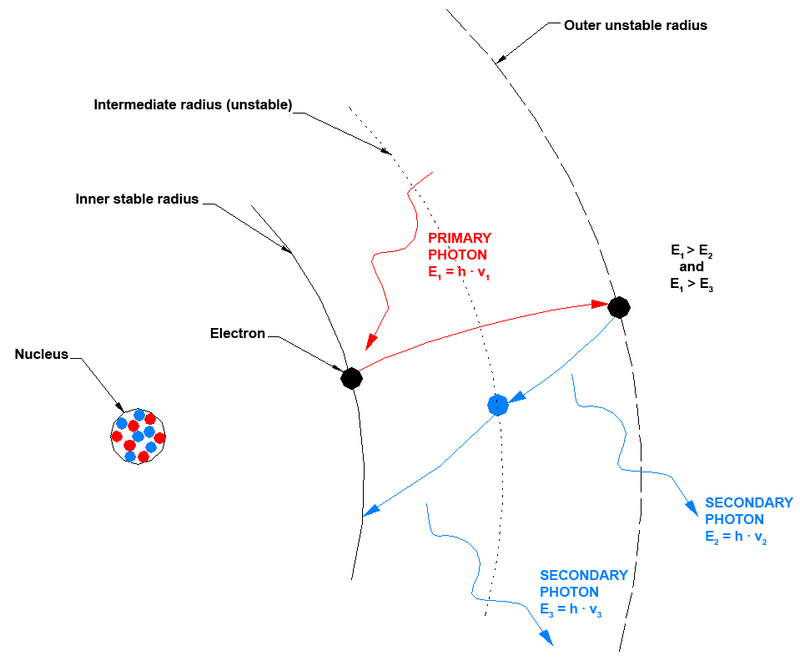 One photon for example moves the electron to the 1st intermediate radius, another photon then lifts the electron to another larger intermediate radius, and a third photon finally moves the electron to the outer radius. these radiuses only for a relatively short time before they return to their initial state again. This so-called recombination typically lies in the nano-, micro- or millisecond range. Since with the "Anti-Stokes effect" several photons are required to move an electron to an outer electron radius, this also is referred to as a so-called pumping process. During "pumping" the primary photons repeatedly lift the electrons from one intermediate radius to the next, they so to speak pump the electrons to the outer electron radius. The further outside the electron path lies, the higher is the potential energy of the electron on the path. It has a higher energy level. A higher difference between two energy levels means a higher energy of the photon that is generated when the electron returns to its stable level. What are "rare earth metals"? (17 elements) also belong to the rare earths. Among others (rare earths for example also are needed for permanent magnets) the rare earth metals also have special spectroscopic properties. Unlike semiconductors (the band gap, i.e. the energy difference between valence band and conduction band of a semiconductor depends on the temperature, and thus also the wavelength that is emitted by the semiconductor crystal) rare earths have a discrete energy spectrum (i.e. defined energy levels in the electron shell) in the solid body (crystal). This means that for the absorption of electromagnetic radiation a certain wavelength is required that depends on the difference of the energy levels. Optical energy emission (to the outside) also is performed in discrete wavelengths that are determined by the crystal. The optical properties can be correspondingly influenced and specifically changed by targeted doping of the rare earth crystals. Erbium, for example, is used as a so-called activator. This activator so to speak acts as a "catalyst". With rare earth crystals electromagnetic radiation in the infrared range (IR) is frequently used for detection. The absorption lines often lie at 980 nm or 940 nm, but absorption lines in the visible range (e.g. at 640 nm) or in the UV range (e.g. 365 nm or 385 nm) also are possible. 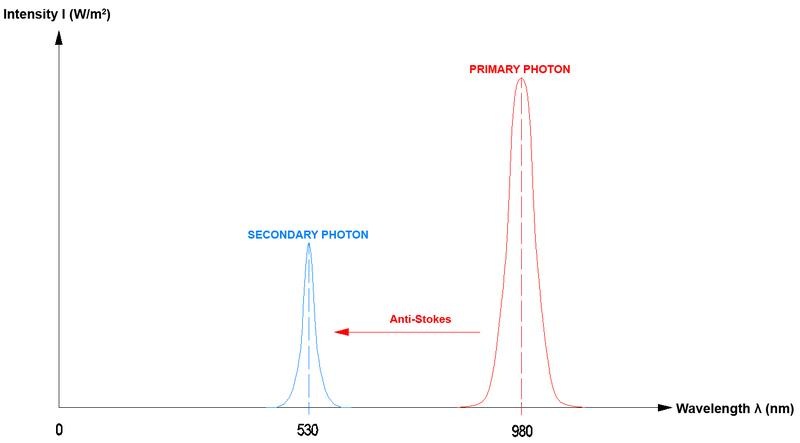 In practice the "Stokes effect" and the "Anti-Stokes effect" frequently occur when photons are emitted. Usually there is a difference of some decades between the optical power that is required for exciting the process and the optical power that is actually emitted by the crystal. 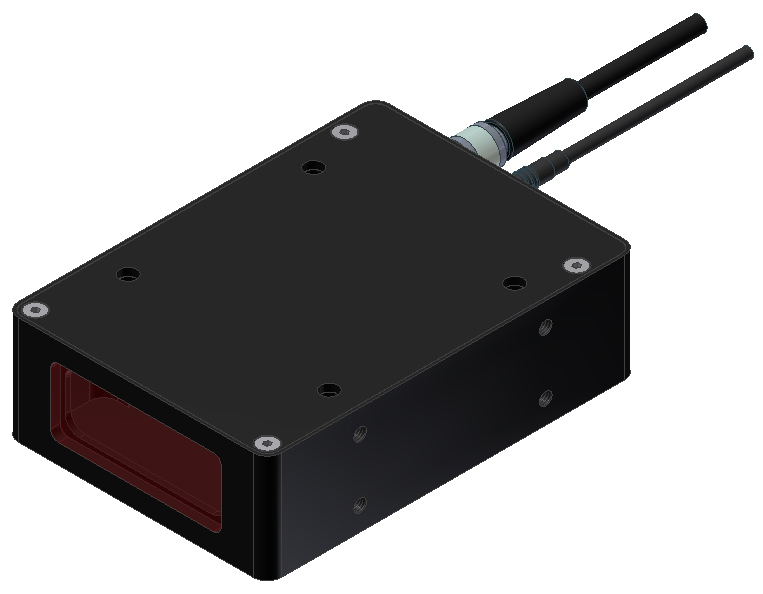 The optical power required for excitation in the IR range approximately is 10 mW (e.g. 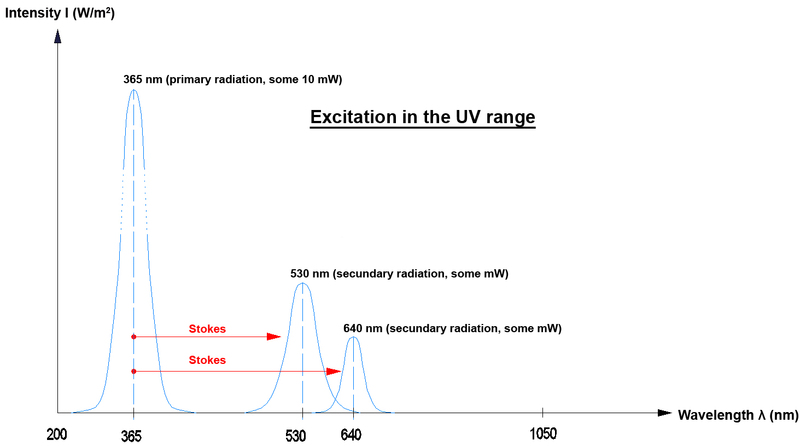 with 980 nm), the emission then lies in the visible wavelength range with some µW (Anti-Stokes). 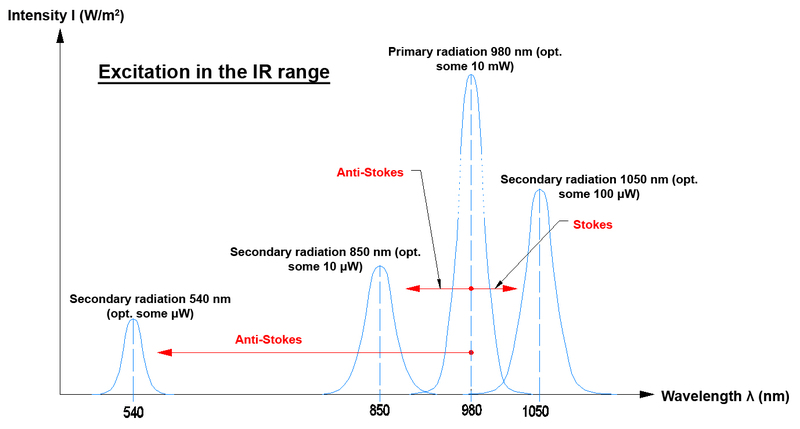 In the IR range, however, the emission also may come close to the mW range (Stokes). 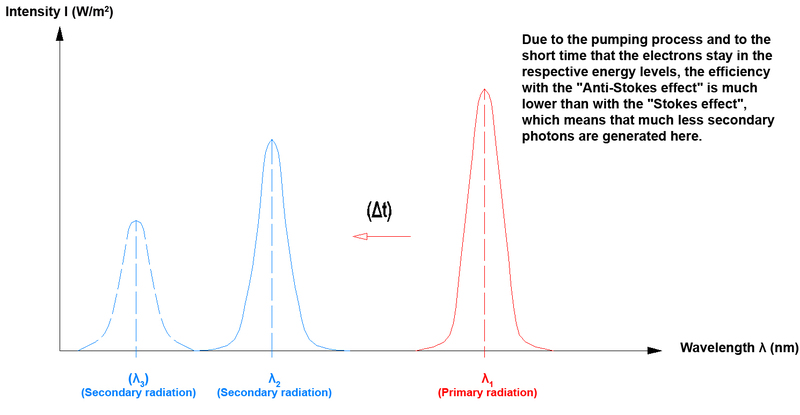 A part of the primary radiation first also is used to excite the crystal, photons are thus used to generate phonons, which increases the lattice oscillation (crystal). In the following step photons (light) may in turn be generated by phonons (lattice oscillation). In an optical sense an "UP-Converter" converts light (from the UV to the IR range) of a longer wavelength (i.e. with lower-energy photons) into a shorter wavelength (the photons then have more energy). This energy gain is achieved by way of "optical pumping". 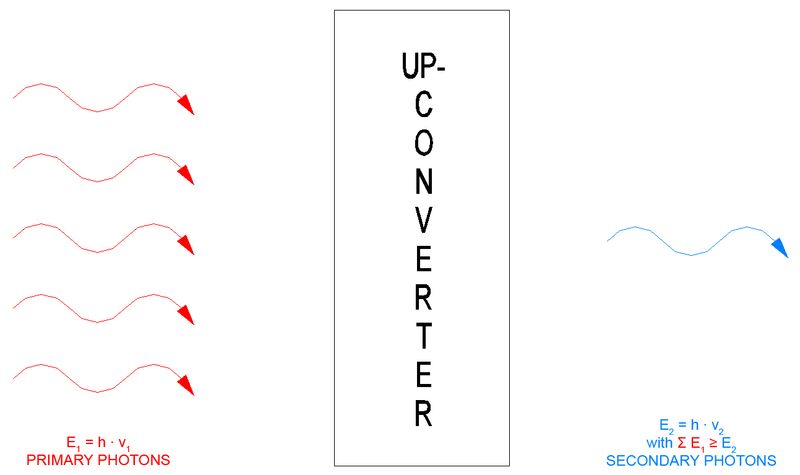 In order to emit a secondary photon the so-called up-converter must absorb the number of primary photons that is necessary for reaching the energy level of the secondary photon (until the electron has been lifted to the outer electron shell). This also is referred to as the so-called Anti-Stokes effect. 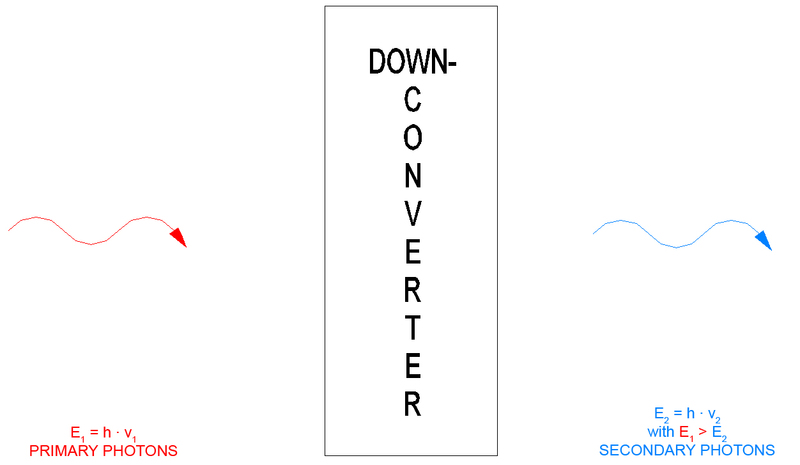 In optics a "DOWN-Converter" means that the secondary photon that is generated by a primary photon has less energy. This means that only one primary photon is necessary to generate a secondary photon. The energy difference for example is given off into the lattice of the DOWN-Converter crystal (as a phonon increase of lattice oscillation). The process in the DOWN-Converter can be explained with the Stokes effect. What is "relaxation time" and "time constant"? In optics the relaxation time is the time that an object needs to return from the excited state to the initial state again. The time constant t is a measure for this time. It describes how long it takes until a process - starting from the excited state - has faded to approximately a factor of 1/2.71 or to 1/e (e is the so-called Euler number). The time constant usually is used for processes that fade exponentially. Practice has shown that excitation processes that follow both the Stokes and the Anti-Stokes effect approximately fade exponentially. Security pigments are inorganic, luminescent (phosphorescent, i.e. afterglowing) pigments, frequently rare earth crystals, but also zinc sulphides, that with corresponding individual doping have highly specific optical properties. This "optical fingerprint" can be used as a security feature. In connection with rare earth crystals grain size is the crystal size after processing (e.g. pulverising or condensation). Usually the grain size lies between 300 nm and 20 µm in diameter. With respect to the Anti-Stokes and Stokes effect the efficiency decreases with smaller grain sizes. In practice, grain sizes of 5 µm to 10 µm are used as a rule. Producing grain sizes of less than 1 µm furthermore requires great efforts and therefore is correspondingly expensive. Because of their extremely small grain size (sometimes less than one micrometre) rare earth crystals that are processed this way also are referred to as LNPs, i.e. as luminescent nanoparticles. In addition to the standard applications of rare earth crystals in permanent magnets, X-ray machines, TV screens, and in LEDs, plasma and LCD screens, and fluorescent tubes, some of these lanthanides as well as yttrium also are used for product authentication. For this purpose the rare earth crystals are doped as required (e.g. with the erbium activator), which results in a corresponding modification of the optical properties. The optical response thus becomes product-specific and in a way represents an "optical fingerprint" that is hardly reproducible if the respective "recipe" is not available. Doping of the rare earth crystals can be used to influence the excitation wavelength, the emission spectrum, and the time constant, i.e. the delayed response to a primary lift (optical excitation impulse). In this connection the rare earth crystals have the important property of withstanding temperatures of typically up to 800°C. The crystals also are not toxic, which means they can be used for a wide variety of applications. These inorganic pigments furthermore have a high light stability, which means that their luminescence properties are maintained over a longer period of time. 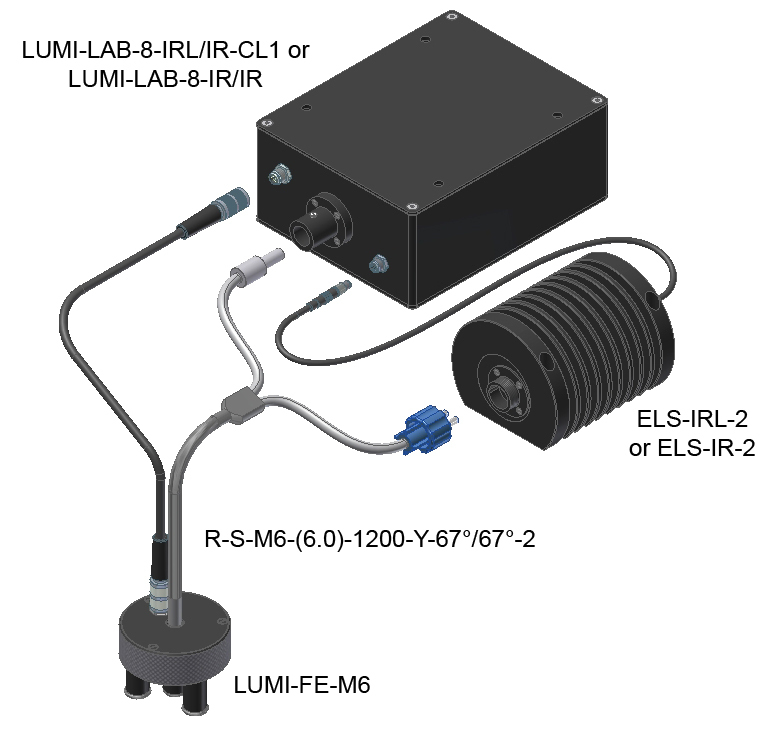 Today a variety of detection devices are available that allow the detection of rare earth crystals INLINE (LUMI-INLINE series), OFFLINE at the place of use (LUMI-MOBILE series) and in the laboratory (LUMI-LAB series). The concentration of rare earth crystals with respect to the carrier material (host) may go down to the ppm range (depending on the type of rare earth crystals). How can rare earth crystals be detected? Since rare earth crystals act both as an UP-Converter and as a DOWN-Converter, the secondary spectrum can be used for detection. 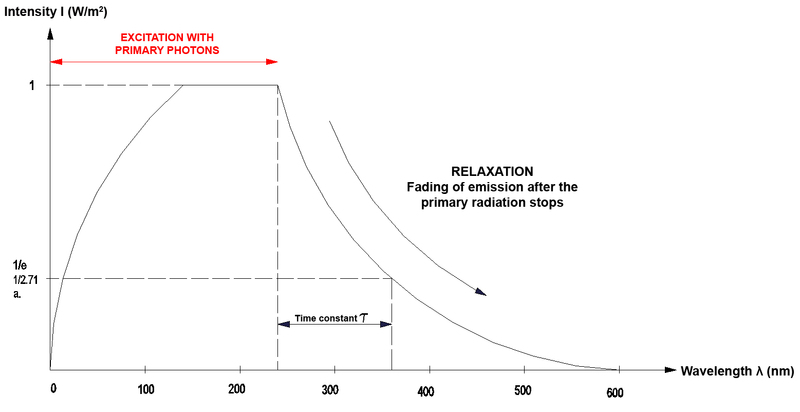 The time fading (relaxation) of the secondary radiation also can be used for detection purposes. Both these effects (secondary spectrum and relaxation behaviour) in combination allow a reliable detection even with very low concentrations. Which devices are available for detection? The most simple and most inexpensive detection device is the so-called laser pen (type LUMI-LP-IRL/UV/VIS-3B), which features a laser radiation with a wavelength of 980 nm and a power of some 10 mW. The laser radiation is focussed at a distance of 10 mm to 20 mm from the pen exit aperture. If there is a rare earth crystal (and provided that this crystal absorbs the 980 nm radiation), the IR light is converted into the visible range (UP-Converter), and depending on the doping blue, green, yellow, orange, or red light will be emitted. lies in the laser class 3B range. The laser pen is a product of laser class 3B. Such a laser class 3B product may only be used when suitable laser protection glasses are worn (e.g. type LUMI-SG-IRL-3B), and only in rooms that are protected against access from the outside with corresponding warning signs and warning lights. The laser pen detects concentrations of rare earth crystals down to approx. 50 ppm (depending on the respective crystal). The LUMI-MOBILE devices avoid all these problems and make detection of rare earth crystals much easier. These devices use IR LEDs with a wavelength (centre wavelength) of approx. 940 nm and are thus absolutely non-hazardous for the human eye (similar LEDs also are used in remote controls for TV sets or audio systems). The LUMI-MOBILE devices use the time constant of the relaxation curve of the rare earth crystals as detection criterion. They are able to detect concentrations down to the 1 ppm range. In the production of materials that carry rare earth crystals the concentration of the rare earth crystals must be monitored. This can be done with the devices of the LUMI-INLINE series, which in addition to the time constant also detect the intensity (and thus the concentration) of rare earth crystals in the carrier material. 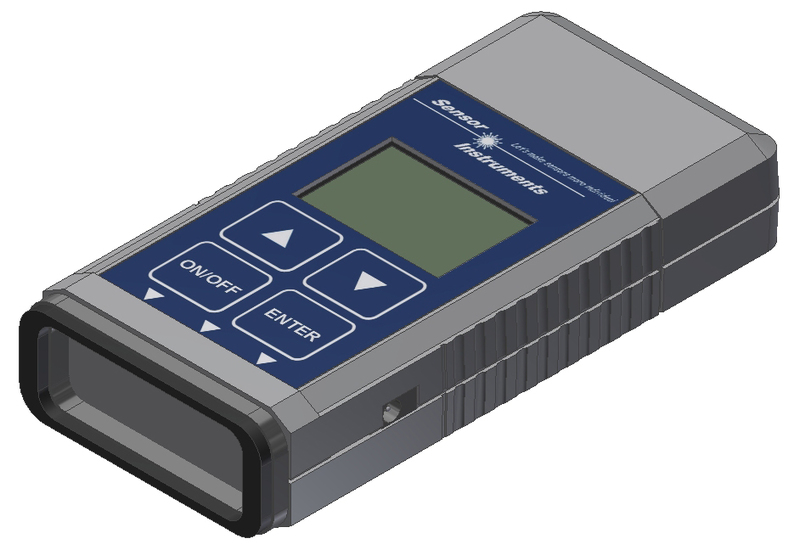 The detection devices provide both analog and digital signals, and they can be connected to a serial interface (RS232, USB, or Ethernet). 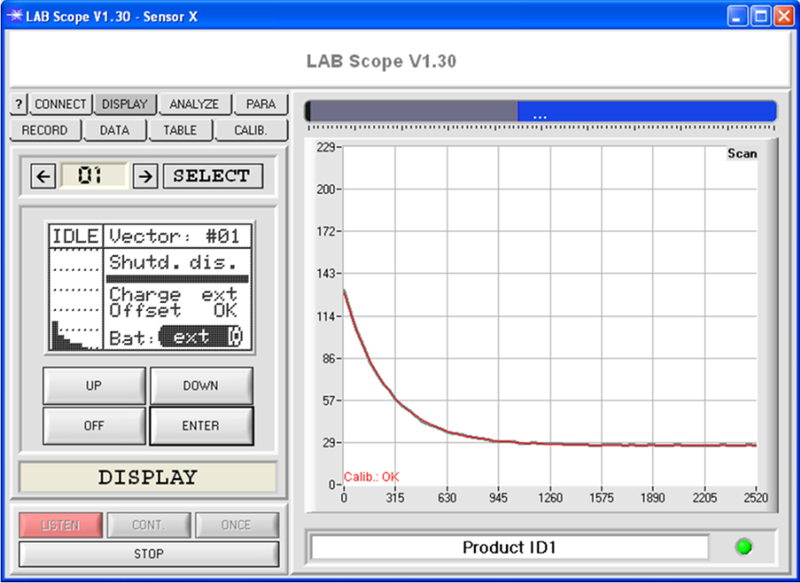 A special monitoring software can be used to record measurement data. For detection in the laboratory there are devices that record both the relaxation behaviour (in the IR range) and the emission spectrum in the visible range (LUMI-LAB-IRL/VISIR-CL1), and devices that record the relaxation behaviour in the IR range and the intensity divided in wavelength range segments from 700 nm to 1100 nm (LUMI-LAB-IRL/IR-CL1, patented). Both detection devices belong to laser class 1, which is achieved by means of a special, patented process. The LUMI-MOBILE devices evaluate the relaxation behaviour of an optically excited object. An IR pulse or UV pulse is directed onto the object to be inspected. 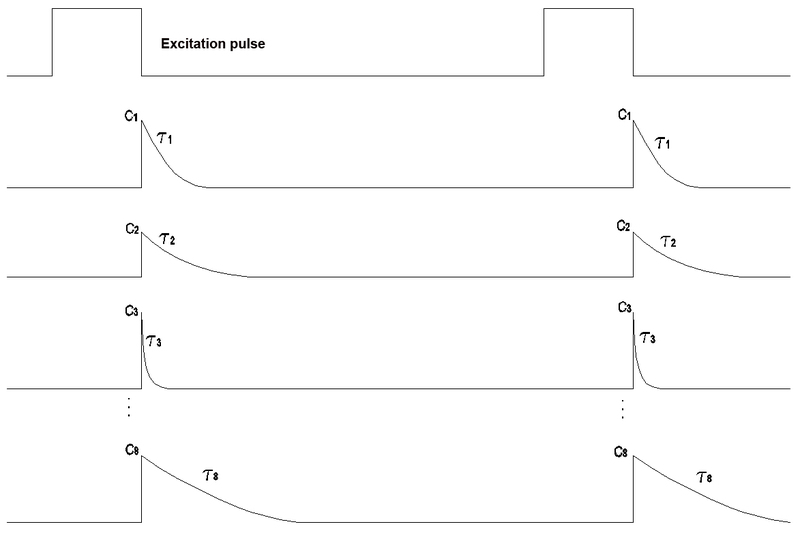 After the end of the excitation pulse the relaxation curve is recorded and evaluated. The initial intensity of the relaxation pulse also is determined. Parameterisation of time constant and intensity for up to 31 products. These are saved in a file at the PC and are used as parameters by the LUMI-MOBILE-QC (Quick Check) devices, and as product parameters by the LUMI-MOBILE-PT (Pocket Tester) devices. These devices can save up to 31 products that can be read from a file (the products have been determined with a LUMI-MOBILE-LAB device and saved in a file before). The detection of a product is indicated both acoustically and optically on the graphic display. The devices check the relaxation behaviour of the rare earth crystal. Unlike the LUMI-MOBILE-QC devices these detection devices work with one parameter set. Unlike the LUMI-MOBILE-QC and LUMI-MOBILE-PT devices these detection devices do not search for certain products that have first been determined by a LUMI-MOBILE-LAB device. These devices generally search for a time constant and for a concentration of a rare earth crystal, and they do this over the complete dynamic range, i.e. from a very low concentration in the ppm range up to a very high concentration. These devices feature a two-colour LED display. Green indicates that a rare earth crystal has been detected, red indicates that nothing has been found. The optical signal is accompanied by an acoustic signal. Similar to the LUMI-MOBILE-DA devices these devices also search the complete dynamic range and detect both very low concentrations (in the ppm range) and very high concentrations. 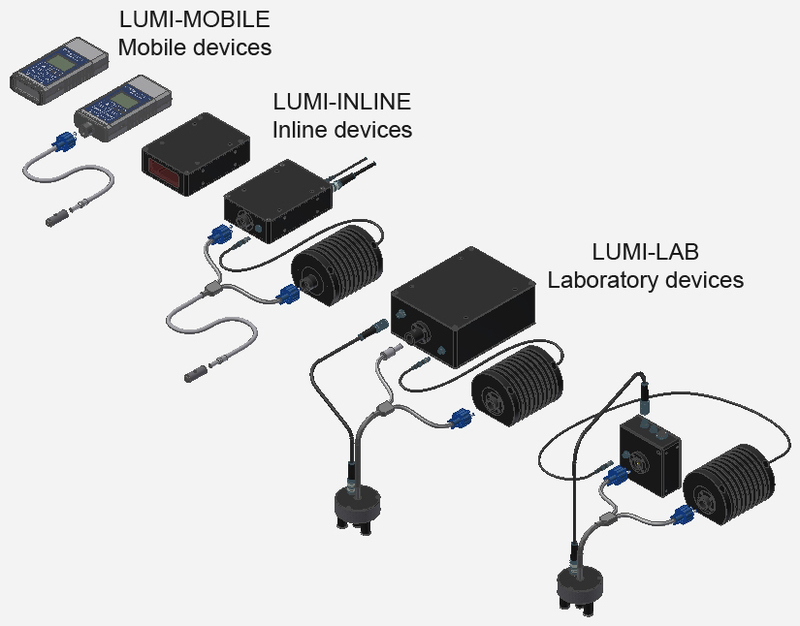 The LUMI-MOBILE-FIO-LAB optical-fibre device essentially is identical to the LUMI-MOBILE-LAB standard device. Only the optics have been modified for optical-fibre connection. 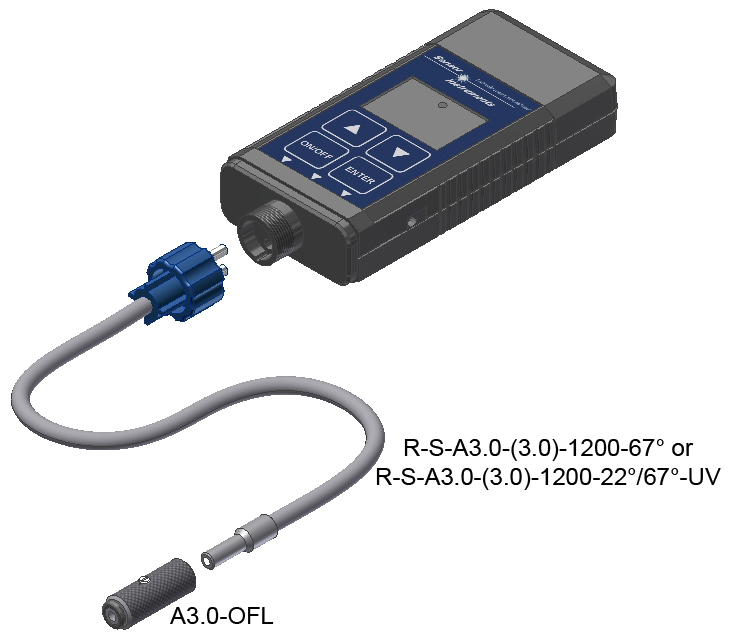 The LUMI-MOBILE-FIO-QC optical-fibre version has the same software as the LUMI-MOBILE-QC, only the hardware in this device features an optical-fibre connection. The LUMI-MOBILE-PT also is available as an optical-fibre version LUMI-MOBILE-FIO-PT. The software is the same as in the LUMI-MOBILE-PT standard version. The LUMI-MOBILE-JR also is available as an optical-fibre version LUMI-MOBILE-FIO-JR. 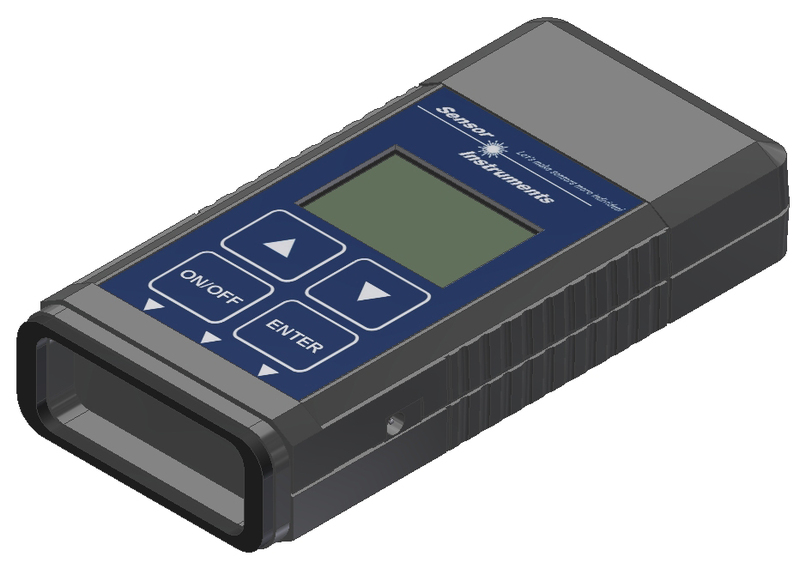 The optical-fibre version has the same software as the LUMI-MOBILE-JR standard version. 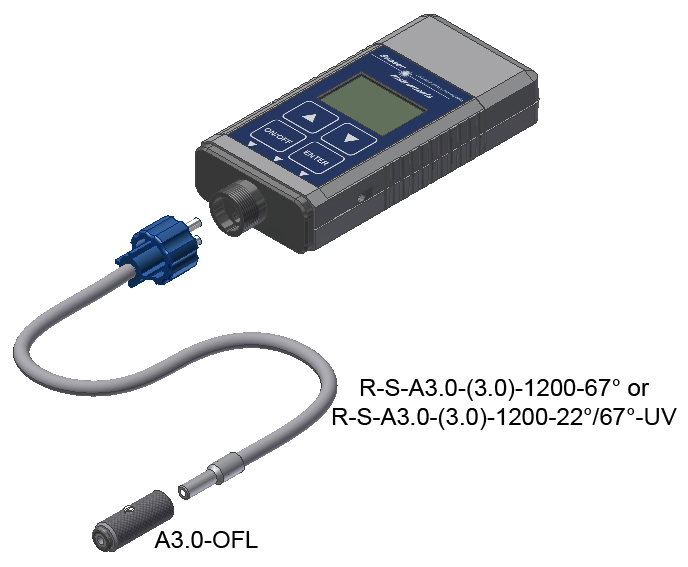 The LUMI-INLINE versionis equipped with two analog outputs that provides information about the concentration of the rare earth crystal, and with 4 digital outputs that can be used to save up to 15 products. 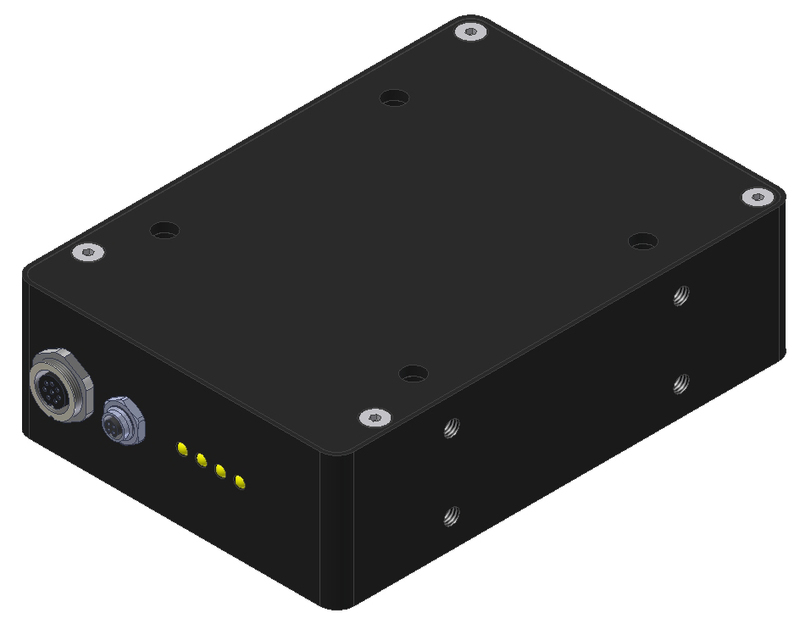 The LUMI-INLINE device also is available as an optical-fibre version LUMI-INLINE-FIO. 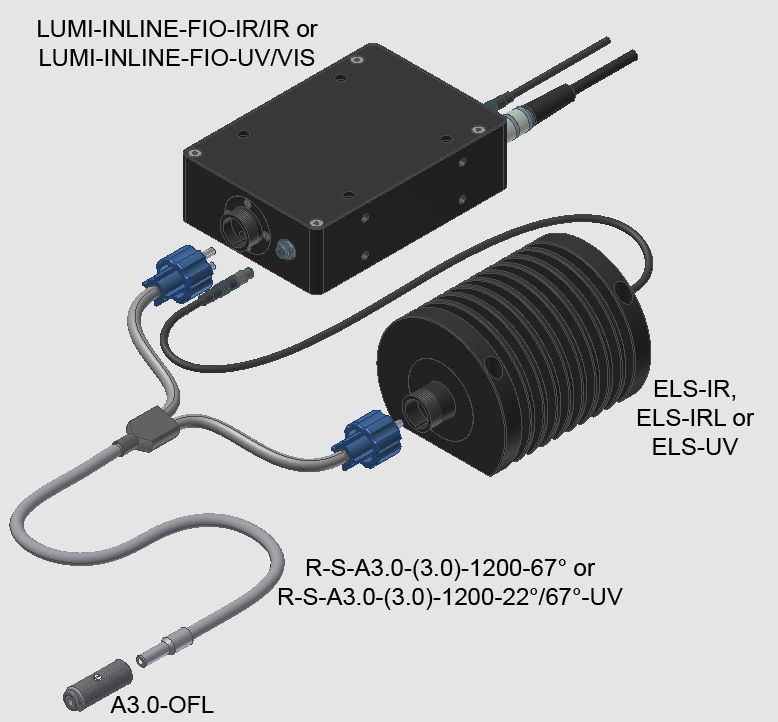 Three light sources are available: Two versions in the IR range (one IR-LED type and one IR-LD type), and one UV version. 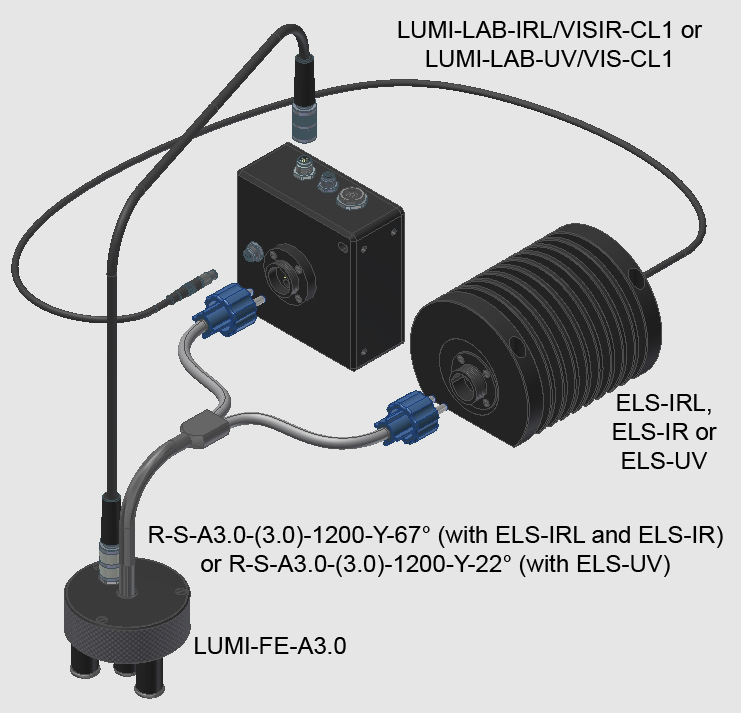 These LUMI-LAB laboratory devices allow the representation of the secondary spectrum in the visible range. The LUMI-LAB-IRL/VISIR furthermore records the relaxation times in the IR range, and the LUMI-LAB-UV/VIS represents the relaxation curves in the visible spectrum range. 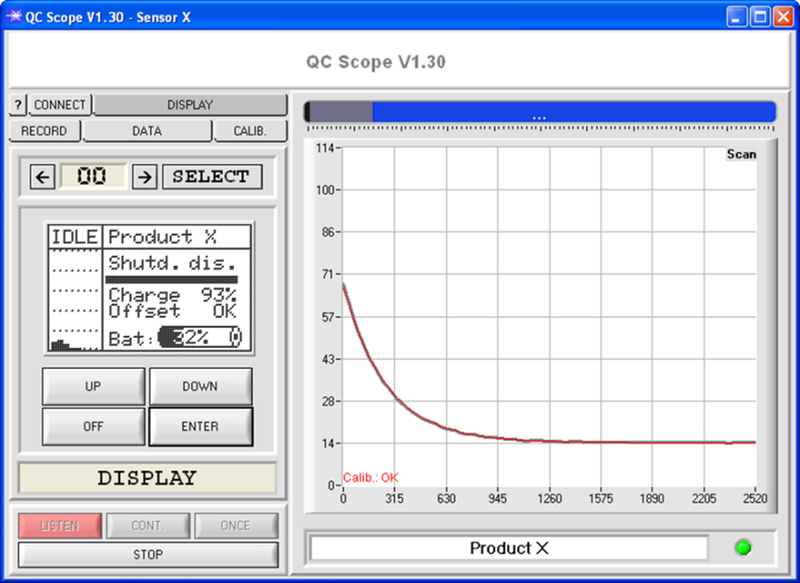 This version checks both the secondary spectrum and the relaxation behaviour in the IR range. The IR range is divided into 8 segments for this purpose. Both the time constant and the intensity of the secondary radiation are determined for every segment (patent pending for the process). Measurement is performed with 8 detectors in the wavelength range from 700 nm to 1100 nm. Every detector checks a measurement window of 50 nm and determines the initial intensity C1 and the time constant t of the respective relaxation pulse. 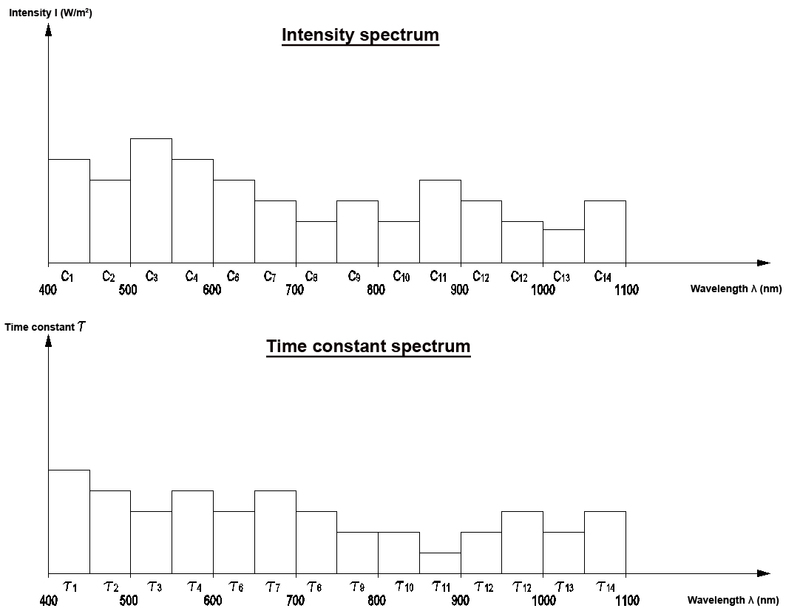 In addition to the IR spectrum these LUMI-LAB types also evaluate the visible spectrum. For this purpose they use a total of 14 detectors that cover a wavelength range from 400 nm up to approx. 1100 nm. They evaluate both the intensity and the time constant in the respective wavelength range.